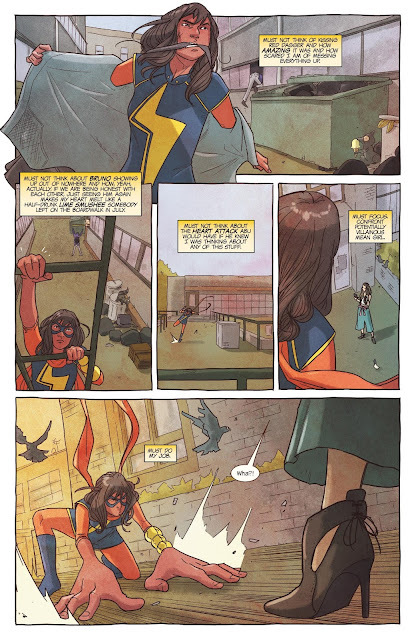 It’s the end of a short two-part story here in Ms. Marvel #30 and while it was fun and well written, it brought back some plot points that could leave a new reader pretty lost. 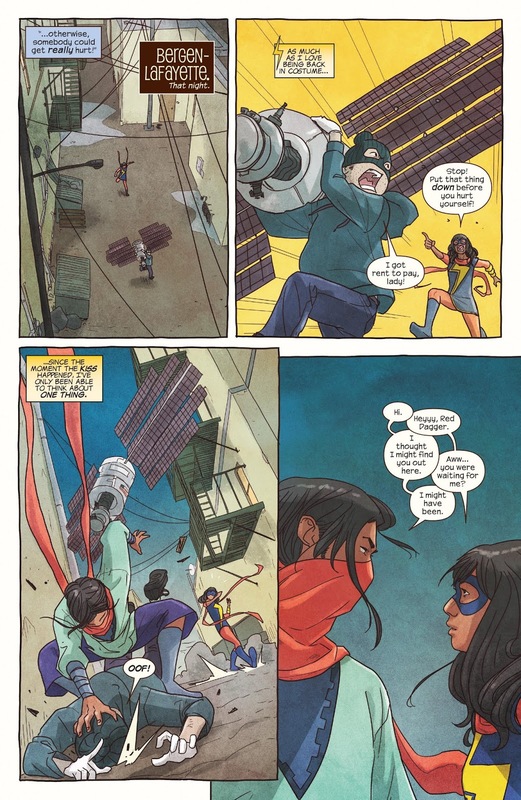 But for those who have been following the exploits of Kamala Khan for a while, it hit all the right notes and tie up some loose ends. 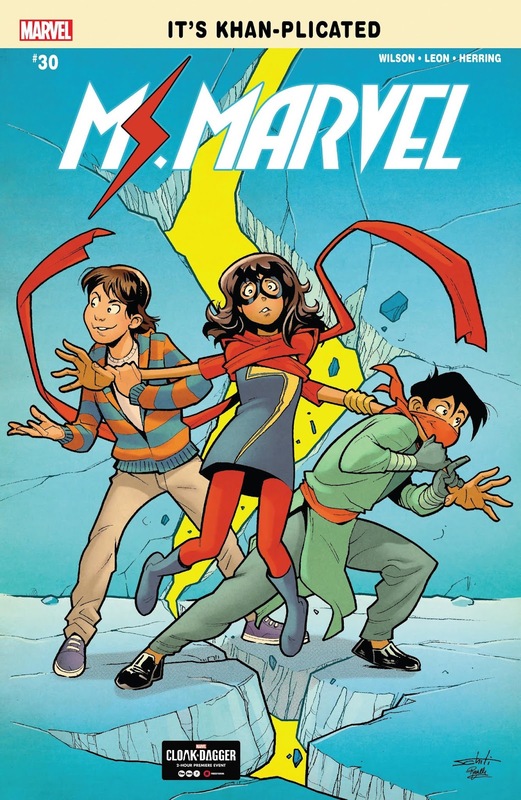 The last issue was particularly good as it closed with Kamala getting life lessons and the reveal of the newest mean girl in school being a supervillain! Will this issue be as good? Let’s dive in find out. We open with Nakia trying to calm down Mike in the bathroom as she’s worked up over seeing her ex-boyfriend, Bruno, who just moved home from Wakanda. Then Zoe barges in revealing that the new cheerleader, Kaylee, is a super villain! If you are a new reader these names will mean little to you and the relationships explored in this issue will feel kinda pointless. If you’ve been reading this series, however, you’ll probably enjoy it. This scene feels like something you might have watched once on a teen soap set in high school… with super-powered cheerleaders as the big bad of the episode. We then see Ms. Marvel and Red Dagger share a moment together while beating down on a bad guy and talking about their feelings. They shared a kiss in the last issue and now Dagger wants to get to know the girl under the mask, but Kamala runs off before he can get an answer. We shift back to school where we see Kamala passed out on the steps and get some classic high school moments, which is really where this series makes its mark. G. Willow Wilson has always done an excellent job of capturing what it feels like to be different in high school, as each of the main characters highlights a unique part of that. Again, if you haven’t been following the book for long those subtleties may go over your head here. We then get the reveal that the new villain is none other than Doc. X, who is a sentient AI computer virus that Kamala fought a while back. It is currently pretending to be this new cheerleader for reasons that aren’t exactly made clear, but we just kinda roll along. Mike and Bruno get their moment before Kaylee and company pass out flyers for a school dance coming up. It feels like editorial put the squeeze on Wilson for this arc, as it is something that I could’ve easily seen stretched to four issues. But with the big celebratory Issue #50 coming up next month Marvel probably just wanted to clear the decks for whatever story they have planned in that. The pacing did feel like an issue, but there’s only so much you can do with oh so many pages. Art was solid throughout. For what it is, this was a fun and banter laced issue.